First thing I noticed when I opened the box, was that this is a quality tool. Machined and anodized aluminum, with the A2 corner chisel itself cleverly held in place with several small magnets. 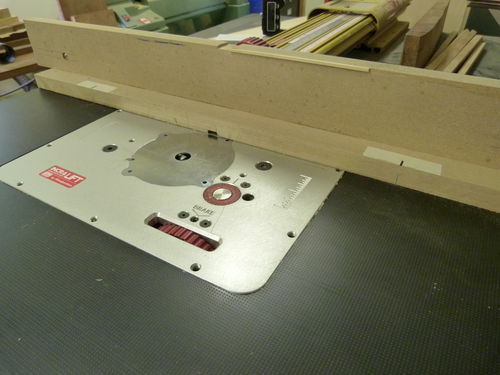 I first had the opportunity to use the prototype for this jig at Andrew’s workshop in Shropshire, England. I was there to learn, and when we got to the topic of inlay, Andrew produced a small flute case with a routed inlay groove pre-cut to use as a demo. He produced the prototype jig and said “Here, give this a go.” He dropped the jig into the corner (which retained a rounded corner from the spiral cutter he used) gave it a solid rap with a very old hammer, and voila, much to my delight, a perfect square corner, ready for the inlay band! He proceeded to explain that he was working with the Veritas folks to make the jig available commercially. Well, after more than a year, it’s finally here. And, it does exactly what it’s supposed to do. I’ll try to give you a verbal and visual idea of just what it does and how it works. The first picture shows the jig itself. It has a quality feel to the hand that’s not at all obvious in the picture. 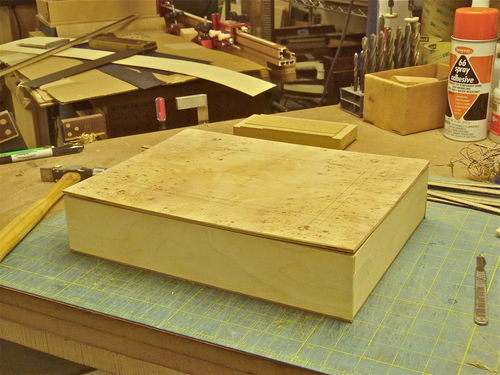 Here I have the lid panel for a document box I’m making for my wife (to hold papers she keeps next to her laptop). 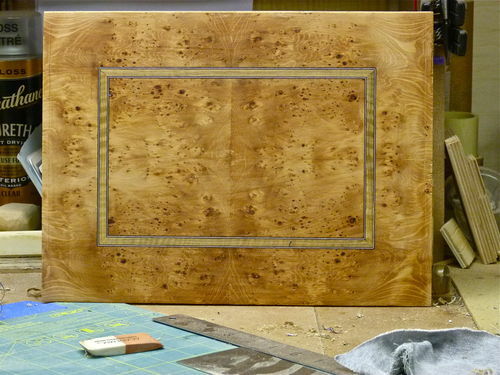 The panel is of 1/8” Baltic birch ply, veneered with a four-way match of English pippy yew. This inlay will be on the underside of the lid. I’m going to cut the groove for the inlay band on my router table. The cut will be made with the panel upside down, using simple marks on the MDF fence attachment. 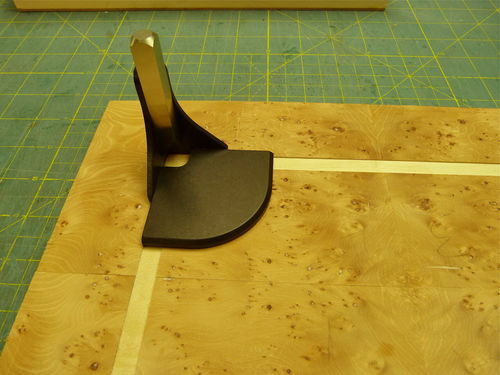 I could use the Incra stops on my Incra LS fence, but I want to show that this MDF fence method is simple, easy,- and works on any router table. The important thing here is placing the pencil marks on the fence for the stop points. These need to be very accurate, but once marked, one simply lowers the panel onto the cutter somewhere in the middle, then moves the workpiece up to each mark, then lifts it off. In this example, the cutter is set at about .025, or just enough to cut through the veneer layer. NOTE: I laid up this banding to fit the groove cut by a standard 3/8” Whiteside router bit (spiral downcut is preferable, but I didn’t have one handy, so here I’m using a straight bit). This particular banding I’m going to use here is of figured Asian satinwood, sandwiched between veneer layers of black/maple/black. I’m not going to go into the process of making banding, but many varieties can be purchased in pre-made form, or you can acquire Andrew’s books which also describe the process. Steve Latta has a DVD on making banding available from Lie-Nielson which is very helpful and well done. When you make your own, however, you get exactly what your want; the combination you feel works best for your particular project. Takes a little time, but it’s not difficult. With the groove in place, I have one more chore before I am ready to place the banding inlay. In the following corner close-up it’s easy to see the rounded corner remaining after the cut of the router bit. This, of course, needs to be removed. 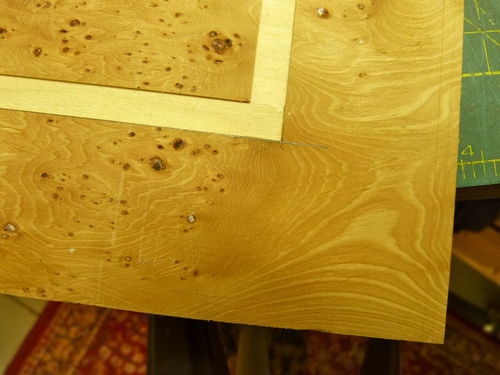 A perfect corner is key to a perfect inlay. The little white lines must line up perfectly, or the error is very obvious. The rest is pretty simple with the aid of the jig. The jig is simply placed in the corner, letting the registration ridges on the bottom drop into the groove. The jig is run snugly into the corner, and given a good rap with a small hammer. Here’s a close up of the resulting clean and perfectly square corner. Now the banding is fitted into the clean groove and glued up. The finished product is shown below after being scraped and lightly sanded level with the veneer. A perfect corner! A closer view. There’s no magic here. Perfect inlays only require a little knowledge, a little patience, and the right tools. Of course, this inlay can be done without the jig. But unless you’re pretty sure of yourself, it’s really easy to overcut, undercut, or slip with the chisel or scalpel when removing the corner. It’s easy to do. (I speak from experience here.) Andrew’s jig makes the process nearly foolproof. 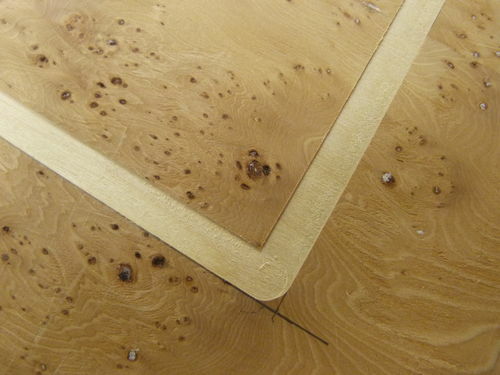 A novice can easily finalize the corners of his inlays without a lot of practice. In this case all four corners were removed in about 20 seconds. As a final note I should mention that there are many more uses for the jig than the inlay I demonstrated above. It can be used to clean up grooves as small as 1/16th inch on up. 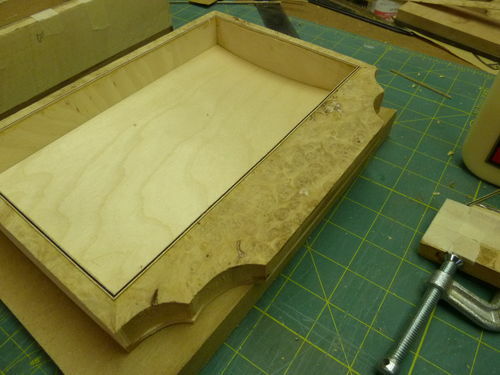 It also works for cleaning up the corners of the small inlaid lines I use around the lid/base openings of my boxes (like the one shown below). Virtually anyplace you want to remove that little rounded corner. 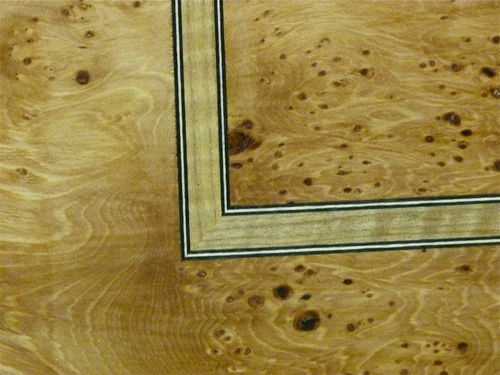 It’s a great product, designed by someone who completely understands the problems of banding inlay, and the solutions. At $79 perhaps it’s not for everybody, but it’s a precision-machined product that does precisely what it is intended to do. Who can ask for more than that? You can get yours directly from Andrew at www.fine-boxes.com as I did, or from Lee-Valley at www.lee-valley.com. Roger great review and documentation of the jig. I had just ordered one yesterday and am waiting for it to arrive. nice review, I was mainly looking at all the tools you have in the pics what kind of fence is that in the second pic it looks like some kind of incra fence? 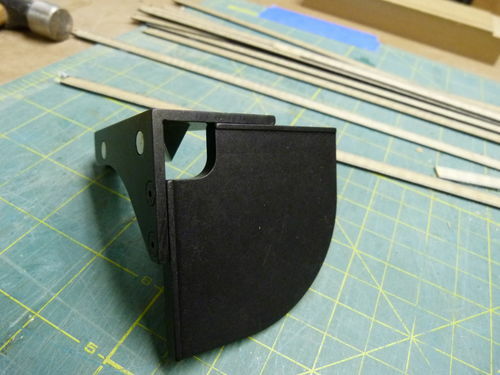 That’s also a nice perfling cutter in the last pic, I’m still tring to figure out how it’s made and used? I have one that goes on the end of a dremel. Do u set the blade so it takes just the veneer off the ends of a box? You can also use this jig for squareing the corners for regular but hinges too. Thanx for the great report, Roger. Now i know what to get when the time comes. Good point Ike on the hinges. I hadn’t thought of that, but the complete jig would certainly work fine on larger hinges, and on the smaller ones you could just remove the chisel and just use that. Either way, it works. Thanks for the suggestion. 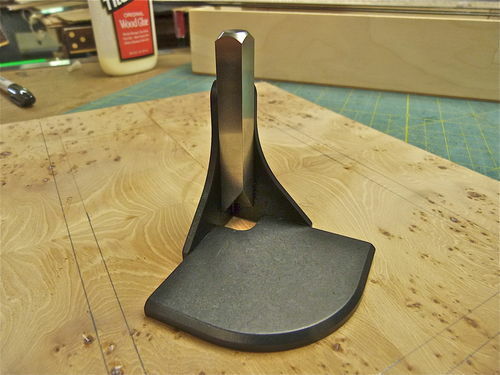 Roger, excellent review of the corner tool….... and a great tutorial on banding inlay for the same price of admission. Great review Roger….... this is one of those tools that I believe just went up to the top 3 for me…. very soon! Nicely detailed review Roger. Most of us have squared the corners for inlays with chisels, but I’m all for any little jig or tool that makes things quicker, easier, and error free I’m adding one of these to my must buy list. Excellent review of a very fine tool! Great review Roger, thanks for the indepth explanation and shots of the tool being used. I want one now!. Cornering tools like this have been around for a very long time, some with chisel type handles, some just the small bar of steel, others with simple holders, none with the sophisticated holder as shown here. I have a few and used them for years doing many hundreds of corners but eventually came around to using only a chisel. I think there are a few good reasons for this. One of them is that you cannot re-sharpen these tools well, it is just about impossible to properly hone the interior angles right up to the point. Second, the use of a chisel allows you to remove material in stages instead of all at once. I have had difficult woods break back of the cut line with this type of tool. And the registration is not always perfect, you cannot see what you’re doing. You hit it and hope. Third, you already have three excellent tools in your repertoire; your eye, your hand and a wide paring sharp chisel that you may press against the side of the groove as you rotate with force. I have had a problem for years with LV inventing tools for problems that don’t exist. Slow down, save your money. But LV did not invent this, I did, based on the Veritas corner chisel. And I did it because in the course of the many box making/inlay classes that I have run, this one little job has regularly presented even some quite experienced, competent woodworkers with a challenge and has resulted in many corners messed up using the traditional wide chisel method. Each weekend I taught [four people] there would be two or three failed corners – usually one chisel stroke too long or outside the routered line, spoiling the final result. 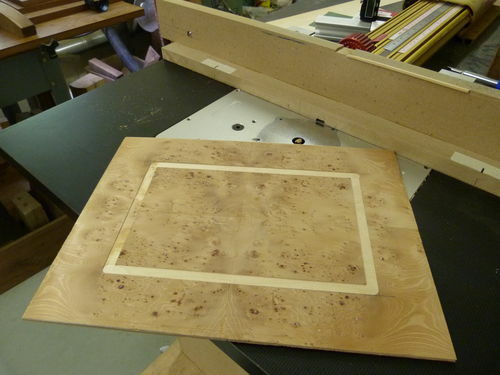 THAT is why I developed this jig – and now, every weekend, without fail, I get sixteen perfectly squared off corners. Quickly, easily. If it’s a job that you’ve done many times, successfully, as you clearly have – fair enough. But there are many out there who are not as confident as you are with hand tools, and this is for them. Incidentally, the registration IS always perfect, that’s the whole point of this! Many hundreds of corners down the line, both students’ and my own work, I can say that with total confidence. As to the sharpening, I certainly take your point. But I’ve had pretty good success sharpening these – and if LV had bothered to consult me when they wrote the instructions for this I would certainly have suggested a couple of ways that they could improve on their sharpening advice! When I first looked into developing this I was going to get it made myself, which would have meant getting the chisel made as well, of course. It turned into a problem and I won’t bore you and others with the details, but the corner chisel would have had a sharper bevel [smaller angle] and therefore less tendancy to chip fragile grain. However, even with the existing chisel I’ve not found this to be a problem. Thank you for your comments – it’s refreshing to get a dissenting view! I hope I have gone some way to answering your well made points. Hmmmmm. Looks like I omitted an important point. How the jig registers in the groove to cut the corner in the right place. From the photo one can see the alignment ridges which drop down into the groove to align the cut. As these are machined to about .060 wide, they will drop right into a groove as small as 1/16”. Perhaps this will help. Gene, sorry about the omission. Hate it when I do that.